The book Polymer Materials for Energy and Electronic Applications is among the first books to systematically describe the recent developments in polymer materials and their electronic applications. It covers the synthesis, structures, and properties of polymers, along with their composites. In addition, it introduces, and describes, four main kinds of electronic devices based on polymers, including energy harvesting devices, energy storage devices, light-emitting devices, and electrically driving sensors. Stretchable and wearable electronics based on polymers are a particular focus and main achievement of the book that concludes with the future developments and challenges of electronic polymers and devices. 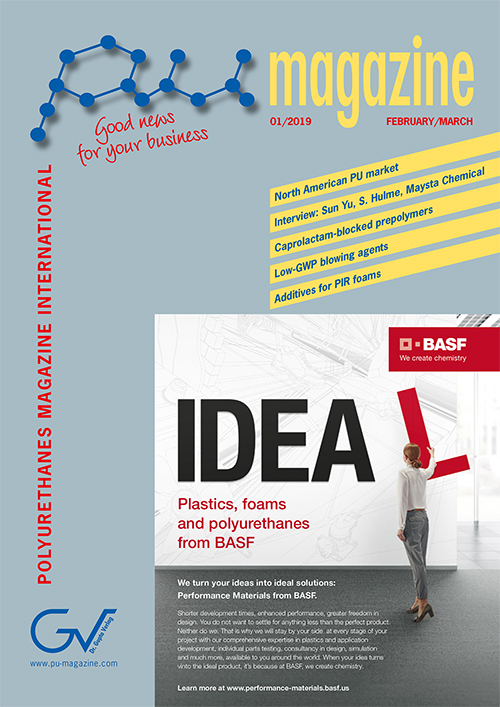 The new issue 1/2019 of PU Magazine International has been published! In this new issue you can read about past fairs and conferences such as imm Cologne, one of the most important furnishing fairs in the world, and the Desma house fair in Achim near Bremen, the meeting place for the global shoe industry. In addition, find out about the upcoming Foam Expo North America 2019, which will take place at the end of March 2019 in Novi, MI, USA.